Chinese students pursuing art and design in the U.S.
Zhengrong Lu, Research Associate at World Education Services, published a piece on March 7th 2016. He focused on the news dealing with the falling rate of Chinese enrollment in U.S. higher ed. According to Lu, “Given the numbers at stake – billions of dollars, hundreds of thousands of students – many institutions face an increasingly urgent need to refine their recruitment efforts. Growing Chinese student interest in fine and applied arts programs may offer an opportunity to do exactly that. More Chinese students pursuing art and design in the U.S. could be seen as salvation of some sort . Lu continues: “At 17,000 in the 2014/15 academic year, the count of Chinese students in these programs remains relatively small in comparison to the overall cohort of more than 300,000. Still, enrollment rates in arts programs represent a significant opportunity. Why are these students coming to the U.S.? Many are doubtless reacting to a “push” from their home country, where the demand for seats in top universities far outstrips supply, and where intense competitiveness in admissions is the norm. This tendency can play out in the arts sector every bit as harshly as it does in STEM fields. For instance, the Beijing Film Academy, one of the best performing arts universities in China, received nearly 25,000 applications in 2015[i] while the enrollment quota was only 489 – an admission rate of less than two percent. Growing employment opportunities in the creative sector and demographic shifts likewise contribute to students’ interest in creative fields. Case in point: China’s movie market is booming. McKinsey & Company reports that box office sales rose by almost 50 percent in 2015 (almost 60 percent of that is from Chinese movies) and stronger growth is expected in 2016. Similarly, the rise of the nation’s new middle class and its powerful “lifestyle market” has fueled an unprecedented interest in – and market for – fields related to design. Students in China’s so-called “Generation 2” (composed of some hundreds of millions of middle class consumers born after the mid-1980s) have broad interests in the arts. The China Dailyreports that the most popular majors for Chinese students in the art and design fields include architectural design, landscape design and industrial design. In addition, fashion design, filmand many other creative art and design majors are also popular among Chinese students. These students face a tough job market at home – the Chinese Academy of Social Sciences reported that nearly 18 percent of new graduates were unemployed in September 2013. This bleak post-graduation landscape may provide yet another push towards the U.S.
Where are Chinese arts students going? Last year, a spate of stories noted a spike in Chinese enrollments in U.K. design schools; however, the U.S. remains the leading destination for such students. Why? While there are likely a range of factors, it’s hard to underestimate the pull of cultural phenomenon such as Hollywood and New York Fashion Week. Another factor may be the rise of a vibrant U.S. architectural industry, which has, thanks to major commissions in China’s cities, put the U.S. (quite literally) on China’s cultural map. For higher ed students, the U.S. has an even more significant draw: It is home to more than one third of the global top 50 art and design schools in the world. Certain regions, especially those such as New York and California, where a range of prominent art and design schools are located, are especially popular among students from China. In fact, an analysis of WES credential evaluation applications from 2008-2015 ranked the two states as the top U.S. destinations for international students applying to art and design programs. This type of geographical concentration parallels experience in the U.K: by 2014, creative arts and design ranked second only to business studies as the most popular course of study among Chinese students in higher ed. What does increased Chinese interest in arts programs mean for institutions seeking to better target their recruitment strategies? 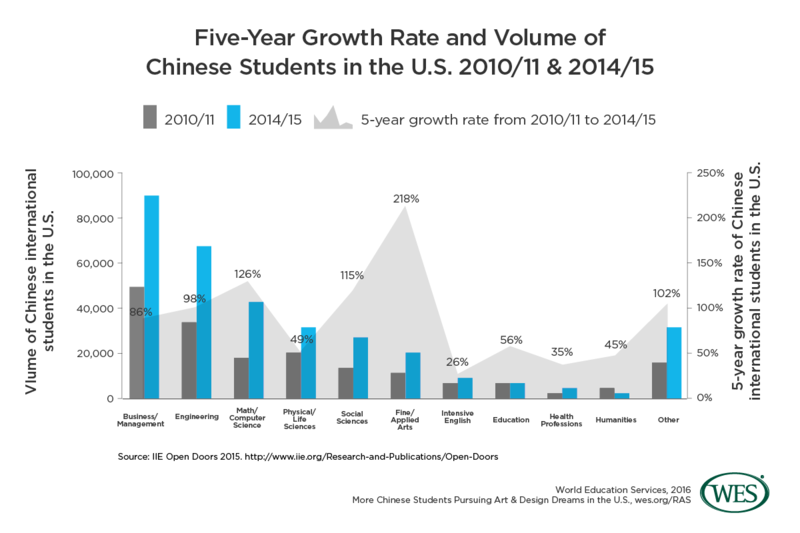 It’s important to recognize that, even as the growth rate of Chinese enrollments slows, the absolute scale of China’s contribution to the U.S. international student count will continue to rise. In the 2014-15 academic year, for instance, more than 300,000 Chinese were enrolled in American higher education, almost triple the number five years before – this even in an era of slowed growth. That said, complacency is not an option , and new mobility trends make it clear that institutions can benefit from a more strategic approach to attracting a broader range of Chinese students. In a paper released last fall, “How Master’s Students Choose Institutions: Research on International Student Segmentation,” my colleague Paul Schulmann and I argued that institutions seeking to attract and retain international students have a clear opportunity to “recognize the diversity of students within China” and to tailor their recruitment strategies accordingly. Thank you for your comment. I was on campus at Rice University a couple of weeks ago and this is clear that the population of students from Asia is important as statistiques prove it. Interesting articled. I will indeed save this as it is quite beefy and packed with several topics of interests. I saw first-hand evidence of this while I was a student at the University of Houston back in the 80’s. There was a very large Chinese, Korean and Philippine student population. They were all tremendously talented and disciplined.